One of the many interesting things about Walker is the combination of living in the city, and living in the woods. I've always thought the Osage Orange tree was an odd tree. Now with Cole I have a new perspective, because they are simply "balls". When you have a toddler who wants to play with the Osage Orange, and try to put it in his mouth periodically, you get down to doing research. And with all its flaws, I like Wikipedia. Also known as the Horse Apple, or Hedge Apple. 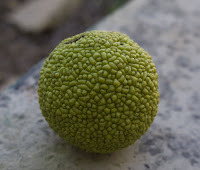 Scientific name is Maclura pomifera. Native to North America, specifically to Arkansas, Texas, and Oklahoma. Inedible, toxic, but not strongly poisonous (so we are hawks when Cole is playing with them). Very few animals care for them, though squirrels will rip open to get the seeds. Used as windbreaks and hedges (thanks to thorns). Straight-grained wood (rare) makes excellent bows, many claim it is superior to Yew wood, which the Brits used for their feared Long Bows. They like to dent cars (that is more of a Walker Street observation). So there you have it. A nice educational entry. We discovered Schneider's Sweet Shop a number of years ago. It is located just 3.2 miles from Walker in Bellevue, Kentucky. It's claim to fame is the Ice Balls with Ice Cream. Basically, you take a scoop of ice cream, add shaved ice and the flavoring. I like Chocolate ice cream, and Cherry ice. Think of a cold cherry tootsie pop. Unfortunately, tomorrow is the last day for this for the season. Another seasonal treat is candied and caramel apples. I've never been a big fan of candied apples (hard red sugar coating) but I love caramel apples, and theirs are great. They have plain, with nuts, with M&Ms, with chocolate and a turtle apple that adds chocolate and nuts to the caramel. Highly recommended. Unfortunately, they have made the last ones for the year, so you'll need to head over soon to get them while they last. Their ice cream is very good. I still prefer Graeter's, and theirs is more like Aglamesis than Graeter's, but it is good. The banana is especially tasty. They also have very good homemade candy and fudge. If you haven't been, and are looking for a new sweet tooth experience, I highly recommend the short trip.